It’s our mission to offer affordable and convenient pediatric services to your family when it matters most. That’s why we are open every day of the year, including weekends and holidays. 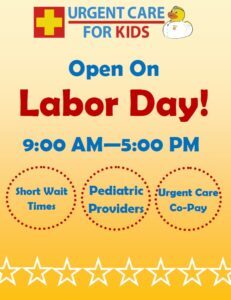 All Urgent Care for Kids locations will be open from 9 a.m. – 5 p.m. this Labor Day, September 3, 2018. Should your child require urgent care attention, stop by or speak with one of our friendly, pediatric providers via VirtualPediatrics. Have a healthy and happy Labor Day weekend!